A short while back we put together a social media campaign for Solidarity Federal Credit Union. The campaign was designed with the intentions of creating awareness for Solidarity, getting their Facebook page new likes, and raising some money for local charity; Kokomo Urban Outreach. The Facebook ad campaign was set up targeting people in Kokomo and surrounding areas. We created over 50 ad variations with different targeting and ad creatives. 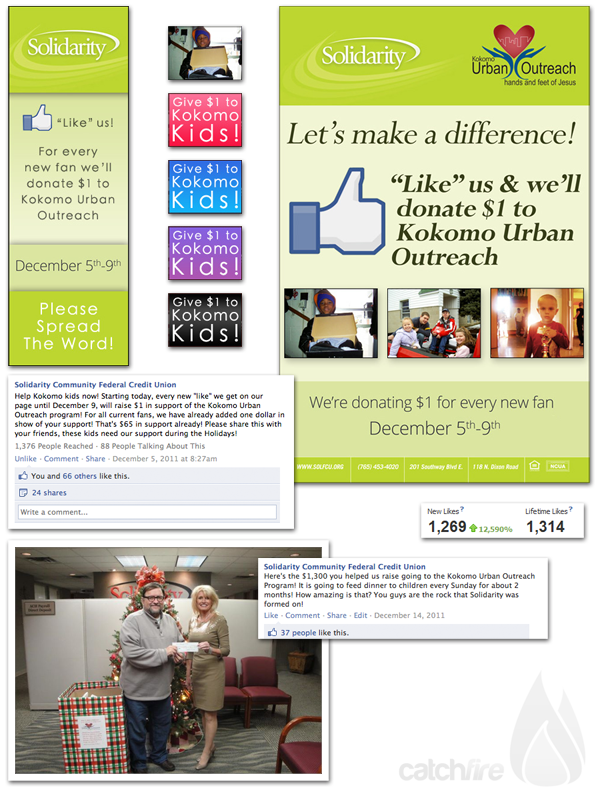 All of the ads had a similar message to them; like our page and we will donate a dollar to help Kokomo kids. We also shared this message to Solidarity’s current fan base, the word quickly spread and before the first day was over, dozens of people had shared the promotion with their friends. The next morning Solidarity’s Facebook page likes had increased by nearly 200 people. The campaign duration was set for a week, during which time Solidarity’s Facebook page likes increased by over 1,200. Of those 1,200 people, only 644 came in through Facebook ads, the rest coming from people who shared the promotion with their own social networks. In the end, Solidarity had raised over $1,300.00 for Kokomo Urban Outreach, gained over 1,200 new fans, and made quite a few people very happy in the process. This promotion, being only five days long, performed greater than anyone had originally anticipated, truly showcasing the power of community and word of mouth promotion.